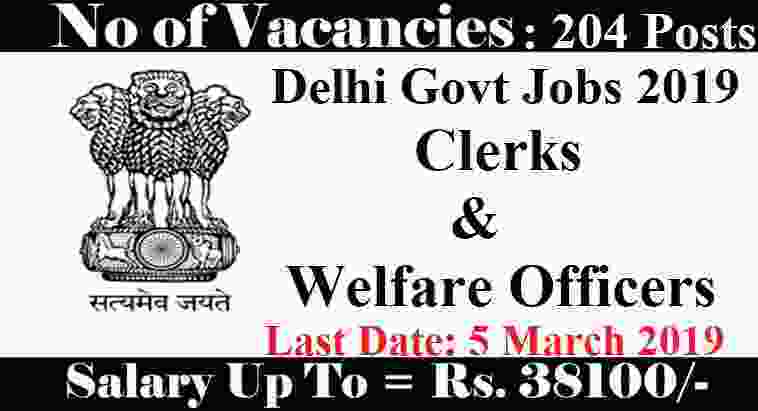 DSSSB Recruitment 2019 for clerk, Steno, Welfare Officer & Other job profiles under Government of Delhi. 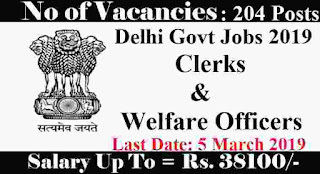 There are total 204 vacancies which are going to be filling up through this Delhi Subordinate Service Selection Board Recruitment process 2019. Various criteria, conditions, process for applying, application fee for applying is given below in this job posting. The process for applying for these Government jobs in Delhi will be active on 31st Jan. 2019. After this date candidates can apply online through the official website only. Under IMPORTANT LINK section we share the reference link including Apply online link as well as the official Advertisement link so for more detail related to this DSSSB Recruitment you can check those links. We also try our best to explain the whole things in this job posting. As we have number of job profiles and each job profile have different criteria related to the education and age so we are using the Table to explain the whole criteria related to the various posts under this DSSSB Recruitment 2019. All Indian Fresher candidates who have passed in their 12th class exam from a familiar educational Board & have good typing speed of 35 w.p.m. in English or 30 w.p.m. in Hindi on computer can apply for this job profile. 10+2 pass from a recognized Board and should have the Speed of 80 w.p.m. in shorthand and 40 w.p.m. typewriting in English (Or) Speed or 80 w.p.m in shorthand and 35 w.p.m. typewriting in Hindi. Those who have a Graduation Degree in Science can also apply. Only those candidates can apply who have a graduation Degree in Law from a recognized university. Applicants having a Master’s Degree in Science stream only can apply these job profiles under this DSSSB Recruitment. Having 3 years Diploma in Environment / Civil and 03 years’ experience can apply. Applicants who satisfied above criteria conditions which we explained above and now wish to apply one of the above job profile have to pay the application fee according to the category they belongs from. In the table below we explained the Various application fee structure which candidates have to pay according to the category they belongs from. Have to pay the application Fee through one of the following channel: “Debit Card, Credit Card, Net Banking or through SBI Challan”. 1. The applicants must apply through the Online process only. No extra manner of job application shall be acknowledged. 2. The applicants must read the essential INSTRUCTIONS FOR APPLYING ONLINE carefully, which are available on the website of the Board as well as in this article below, before filling up Online Application Form for the post(s) concerned. 3. Profit of reservation for various reserve categories which are: “SC/ST/OBC” etc. shall be given as per the policy of Govt. of NCT of Delhi.